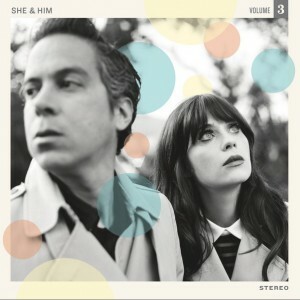 M. Ward and Zooey Deschanel have teamed up once again for a new She & Him album. The creatively titled Volume 3 follows in the footsteps of Volume One and Volume Two. (They also released the 2011 Christmas adventure A Very She & Him Christmas. It's out on May 7 through Merge (May 13 through Double Six in the UK and Europe). They'll follow the album's release with a North American summer tour supported by Camera Obscura and Emmylou Harris with Rodney Crowell. The record consists of 11 originals and three covers , and features contributions from Mike Watt, Tilly and the Wall, Rilo Kiley's Pierre de Reeder, Devotchka's Tom Hagerman, and NRBQ's Joey Spampinato.